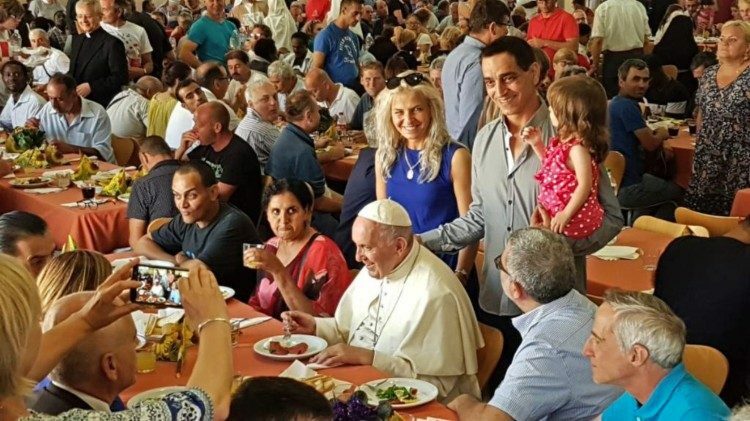 As new Cardinal Konrad Krajewski, the pope’s alms giver, was treating the poor and homeless of Rome to a dinner Friday night, Pope Francis surprised them with a visit and joined their celebration as a guest. There was great celebration on Friday in the Vatican when some 280 poor people were invited to a dinner by new Cardinal Konrad Krajewski, the official almsgiver of the Pope, who was made cardinal by Pope Francis at the Consistory the previous day, June 28th. There were about 60 volunteers serving dinner to the poor, including Carlo Santoro of the Community of Sant'Egidio of Rome, who collaborates with Cardinal Krajewki’s Office of Papal Charities, to assist the homeless in Rome. "It was a specially warm visit because it was a dinner of the new cardinal with the poor,” Santoro said. “To the surprise of all, the Holy Father arrived. We thought it was a simple greeting and he would be off soon,” he said. The new cardinal turned to Santoro asking him to make room close to him for the Pope. Santoro said the Pope greeted everyone with great affection. At the Pope’s table were several Syrian refugees who had arrived through the efforts of the Sant'Egidio Community. One of them travelled to Rome with the Pope after his visit to the Greek island of Lesbos on April 16, 2016. The man told the Pope he is now working and is integrated in Italy. Santoro heard the Pope saying that several times in recent months he has met refugees from Lebanon and was struck by the fact that children were the first to speak Italian. For the Pope, integration is fundamental which is not just welcome. Where there is no job, the Pope said, there is no integration because without job there is no future. Santoro said that at the table there was another refugee who narrated to the Pope how he arrived in Italy. It was an 11-month journey through the desert, a journey full of dangers and pitfalls. He has been in Italy for some years and he too has been integrated. Santoro said that they introduced to the Pope some of the homeless who sleep around St. Peter’s Square at night and collaborate with them every day. Santoro said the Pope was very affectionate to his neighbours. Cardinal Krajeswki explained to the Pope that they collaborate a lot such as for the funeral of someone who dies in the streets. The volunteer of Sant’Egidio Community noted the Pope was touched by and enjoyed the presence of children around him. The Pope blessed a Syrian baby girl, born a few months ago, who was baptized on June 28. Talking with the volunteers, the Holy Father expressed his worry over the issue of children being separated from their mothers in Texas, United States. Santoro, the Sant’Egidio Community volunteer said the Pope also talked to some former prisoners, repeating something that he has often said: “But why not me?”, meaning he could have been in their shoes. When the volunteers told Pope Francis the story of a homeless, alcoholic man, the Holy Father said, “Alcohol could affect any of us because it's an evil that kidnaps you, an evil that doesn't leave you, it's an evil that you can only get out of with the help of others.” Our problem, even as a Church, is to help people come out of difficult situations and do so together, the Pope said. Papa! Leading by example,vthe life of simple and humble holiness. God bless you.